We were so lucky to be invited to Marco Pierre White Steakhouse, for the best lunch of our lives! Affordable glamour. At first glance the phrase looks like an oxymoron, however let me assure you that it is not only possible, but a very real reality at Marco Pierre White’s Restaurant in Hotel Indigo. At just a one minute walk from central station, a friend of mine and I decided to book a table for the lunch time menu, and I am so pleased that we did. Upon entering, we were immediately greeted by polite and welcoming hotel staff. Once our bags and coats had been checked, we were led to a table and presented with a menu. Prices start at just 15.95 per person for two courses and 18.50 for three courses. I opted for the onion soup with crouton to begin. 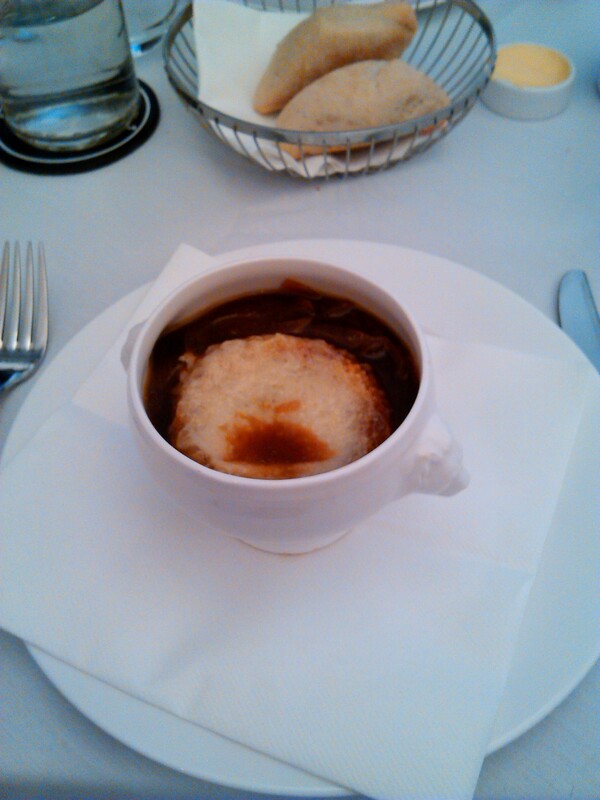 The soup itself was warm (not too hot as to scald your mouth at first sip) and full of flavour. The sliced onions were delicious and the large crouton floating on top soaked up plenty of flavour from the dish. I knew after finishing my first course that we had found something special here. 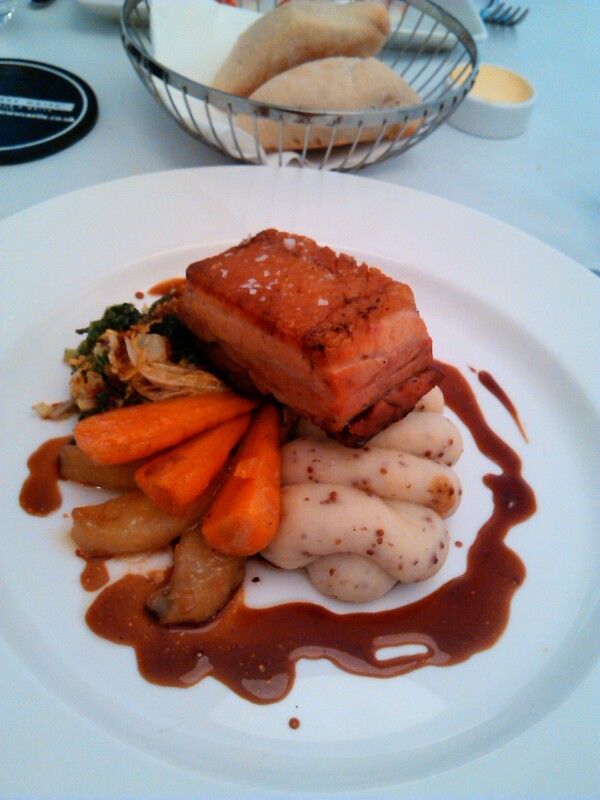 For the main course, I chose pork confit with potato puree and vegetables. The pork was perfectly cooked and came accompanied with cooked apple slices that complemented the confit extremely well. My biggest surprise with this dish, were the vegetables. I’ve always found it rather difficult to grow out of the habit of disliking vegetables, however if it were guaranteed that I’d eat nothing but these vegetables for the rest of my life, I’d seriously consider becoming a vegetarian. In fact, the only thing stopping me would be the pork confit! After a sensational two courses, it goes without saying that dessert was always going to happen. 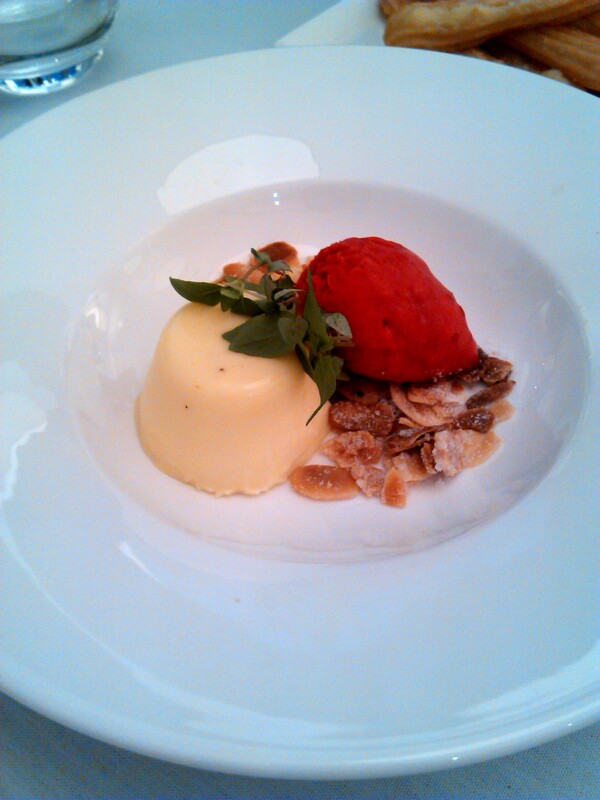 I selected panna cotta with raspberry sorbet and almonds. It was light, refreshing and satisfied my sweet tooth without pushing me to the boundary of being uncomfortably full. The panna cotta in particular was very enjoyable and after one tasting I can already claim it to be a firm favourite of mine. ‘Not your usual hotel-restaurant experience; the Marco Pierre White steakhouse bar & grill offers a “classy” and affordable dining experience. The service was incredible. As soon as we got in, we were stunned by the warm welcome that was given to us by the hostess. After we sat down, the waiter came to our table and presented the menus (which were quite clean, in comparison to some restaurants I have been to). The menu was quite clear and had a wide range of food. However, being a waiter myself, I couldn’t help to notice the astonishing quality of service that was provided by all members of staff throughout the whole dinner. After our meal, we checked out our things and left the restaurant in a better mood. Not only because we were full of wonderful food but because of the overall dining experience. I cannot recommend the lunch time menu enough; it will set you up in a positive mood for the rest of the day. Marco Pierre White Restaurant provides not just high quality dishes served at reasonable prices but an experience, an experience that is usually obtained by spending considerably more. ‘Affordable glamour’, in my opinion, has well and truly been achieved. For updates on their latest offers and delicious food, follow them on Twitter! Marco Pierre White Restaurant can be found at 2-8 Fenkle Street, Newcastle.